We are in the very native biotope of the potato. At last we can taste of the first potatoes as the first Europeans who discovered it in Peru in 1532, thanks to the Inkas of the Andes. 100% ORGANIC, no pesticide, No added colour, no additive of any sorte. We left the skin of the potato in order to keep its’ authentic aroma but above all, all the goodies for the health, its’ vitamin C, its’ calcium, its’ phosphore, its’ natural antioxydants which are in higher quantities than in any other potatoe due to the extreme heights and pure conditions of culture. Then they are processed with extreme attention so as to preserve 80% of the goodies of the fresh potatoe. - the yellow potato is the mythical potatoes dreamt by the most exigent gourmets of the world ; it is slightly sweet and onctuous . Once tasted, you can will never forget it. 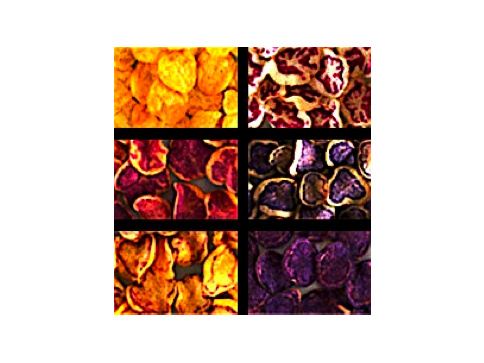 - The red potato, with red flesh, is spécific to Peru – the Conquistadores just forgot to import it – it is more aromatic, sweet, with a slightly balsamic taste. It has a stronger texture and personality than the yellow potato. It is the one the children prefer. - the blue potato, it is the most creativ: the less sweet, with more texture than the others which allows more creativity. It strikes by it’s intense colour which allows playing with stronger aromatic notes and texture. This entry was posted by admin on Wednesday, October 15th, 2008 at 7:53 pm. 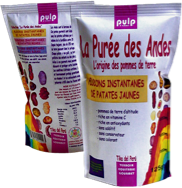 It is filed under Products and has these tags: andes, biodiversity, cordillera, fair trade, gourmets, line of product, mash potatoes, native biotope, organic, original, peru, potato, small producers, sustainable development, tika papa, vitamin C. You can follow any responses to this entry through the RSS 2.0 feed. Both comments and pings are currently closed.